Old buddies Rick Wiggins, owner of DAMAR Heating, Inc. and Gary Geist, co-owner of Lucky Labrador, go way back- they met through an acquaintance 15 years ago when Gary and his partners were opening up a second location in Multnomah Village. Rick designed and constructed the HVAC system in that building, which was converted from an old masonic temple into a gorgeous neighborhood staple that draws a large human and K-9 crowd year round. Lucky Lab now has two breweries and four pubs throughout Portland, and DAMAR Heating, Inc. continues to update and maintain all of their HVAC systems. This last Saturday, the staff at the flagship Hawthorne pub threw a bash to celebrate their 20 years of making great beer in Portland. 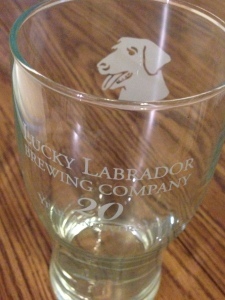 Several of the DAMAR crew members were there taking part in the libations, and they all walked away with some stylin’ 20 Year Anniversary commemorative glasses! If you haven’t done so yet, be sure to stop by one of the four Lucky Lab locations and grab yourself a Super Dog IPA- it’s one of the hoppiest in town, and there’s no doubt it will rouse your spirits in this dreary fall weather!